“Your pockets are empty, yes?” her words echoed, sharp and overly-loud, off the tiled walls of the hospital corridor. I assured her they were. I had emptied them in the car, and security had patted me down twice as we made our way through the building. Psychiatric institutions take no chances—especially not with cases like these. Dr. Sorenson continued her briefing: “he’s an extreme case, granted, but they do happen. Everyday carry addiction . . . not the most common of addictive disorders, but we get a few cases a year. This, though.” she took a long pause, and looked at me pointedly. “25 years of research experience and I’ve never seen anything quite like this.” She swiped her card and opened the door. “I’ll be watching on the security camera. You have half an hour.” She ushered me through the door. 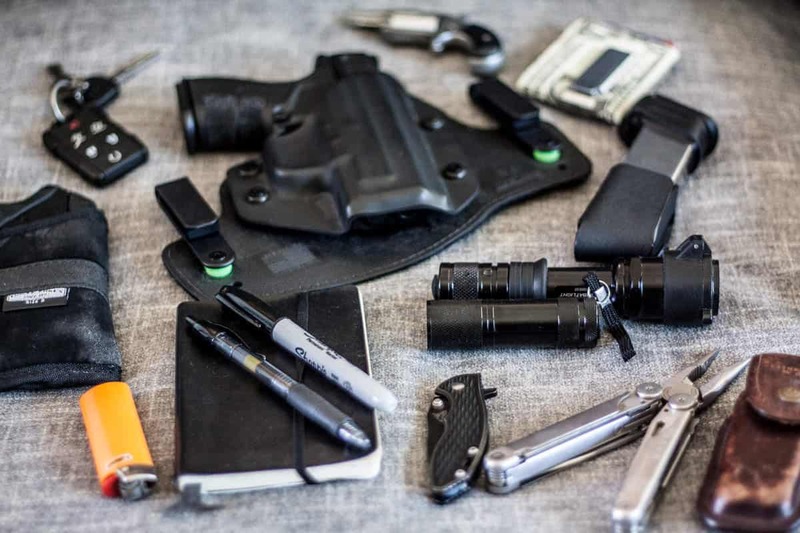 This interview is with an EDC addict. For purposes of anonymity, we’ll call him John. I conducted the interview as an audio recording; what follows is a partial transcript. MJ: Can you tell me how it all started? John: Flashlights. It started with flashlights. MJ: Tell me what happened. John: My wife . . .my wife got me a flashlight for Christmas. Just a little Maglite pocket light—great little thing. Came in handy at work. I used to be a contractor. Then things went wrong. John: I wanted something with a tail switch, so someone sold me their Surefire. My first LED light . . . it was . . . it was . . .
MJ: It’s OK, just take your time . . .
John: It was the most beautiful thing I’d ever seen! So bright . . . the throw, the lumens, the candlepower . . . it was too much . . .
John: (nodding) And I got it. Oh God, I got it. O-light, Streamlight, so many more. It got worse when I discovered the Cold Steel website. MJ: Your first pocket knife. John: My first tactical folder. And then of course, I wanted a multitool . . . for work. I swear it was for work. MJ: When did you start collecting? John: I started ordering other knifes. Kershaws, CRKT . . . I found myself doing cutting tests in my backyard late at night. I said I was making the most of my time—testing the lights and the knives at once, but I was lying to myself. MJ: Where was your wife in all of this? John: I didn’t notice that she was pulling away. The day she left I was alphabetizing my collection of pocket pistols—I was somewhere between Bersa and Kel-Tec when she pulled out of the driveway for the last time. MJ: Is that when you came here? John: I had lost my job, my family . . . I finally had to face it, I had a problem. MJ: How are things going now that you are getting some help? John: I have good days, and bad ones. Mostly good. I’m getting there. (pause) You OK? MJ: Ah, forgive me. Runny nose—some weird allergy. I’m sorry—you were saying? John: That’s a nice handkerchief. MJ: Um, thanks. Just a Wal-Mart cheapie. Comes in handy though. (pause) John . . . what are you doing?